We have had this Wisteria for about 3/4 years and it has never flowered. It just has very vigorous growth - Leaves and shoots climbing high. Could you possibly tell me how to prune (and when) so that we can achieve flowers, or is it too late? Thank you. 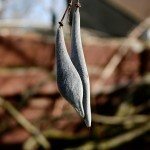 Your Wisteria needs a bit more time to reach maturity and to bloom. The average is 7 to 15 years before flowering.